Carrot Cake with Cream Cheese Frosting-this is the BEST carrot cake recipe and it’s easy to make too! You guys, I made a cake…like a real, layered cake! Are you surprised? I rarely bake layered cakes because they scare me. I am fine when it comes to coffee cakes, bundt cakes, sheet cakes, etc. but layered cakes make me nervous. I know they aren’t much different, you just bake them in different pans, but then you have to layer them, frost them, and make them pretty. That is the part that stresses me out. The carrot cake is actually really easy to make. If I can do it, you can do it:) The hardest part is grating the carrots, but you can cheat and use a food processor. If you want the extra workout, a grate them by hand. It really doesn’t take that long. The cream cheese frosting is not an option though, every good carrot cakes needs to end with lots of cream cheese frosting! I decided to keep the cake “rustic” by adding a layer of frosting between the layers and on top. If you want to go all out and frost the sides, go for it! I just kept my cake simple because I am still a little scared when it comes to frosting layered cakes:) And I like the rustic look! It turned out super cute and SUPER tasty! I ate one piece of carrot cake and loved every bite. I told Josh we had to get it out of the house ASAP or I was going to eat the entire cake. Our friends were happy to take the cake off of our hands. Yay for sharing! 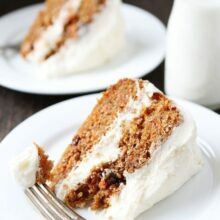 Now, that I am feeling confident in my carrot cake baking, I am going to make this Carrot Cake with Cream Cheese Frosting for Easter dessert. It is a classic Easter dessert and I know the Easter bunny will love it! You should add it to your Easter menu too! 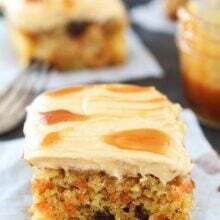 The BEST carrot cake recipe with cream cheese frosting! This cake is perfect for Easter dessert or any day! Preheat oven to 350 degrees. Butter two 9-inch round, 2-inch deep cake pans. Dust with flour, tapping out excess. Set pans aside. In a medium bowl, whisk together flour, baking soda, baking powder, salt, cinnamon, and nutmeg. Set aside. In the bowl of a stand mixer, beat the eggs until combined. Add the sugar and beat on medium speed well combined, about 2 minutes. Add in the vanilla. With the mixer on low, add the oil in a thin steady stream and continue to beat until fully incorporated. Add the flour mixture and mix until just combined. Don't overmix. Stir in the grated carrots and raisins. Scrape batter into prepared pans, dividing evenly. Bake until golden brown and a toothpick inserted into centers comes out clean, about 30-35 minutes. Let cool in pans on a wire rack for 15 minutes. 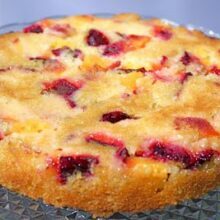 Run a knife around edges of cakes to loosen, and turn out cakes onto rack. Turn right side up, and let cool completely. While the cakes are cooling, make the frosting. In the bowl of a stand mixer fitted with the paddle attachment, combine the butter and cream cheese and beat until smooth. Gradually add the powdered sugar. Add the lemon juice and vanilla, and beat until light and fluffy, about 2 minutes. Using a serrated knife, carefully trim rounded top of cakes. Place one cake, cut side up, on a plate or cake stand. Spread half of the frosting over cake. Invert the remaining cake on top of the frosted bottom layer so that the flat side (the bottom) is on top. Spread remaining frosting over top. This cake looks insanely good and I can see why you wanted to re-home it, asap 🙂 I love carrot cake and would have gone to town on it! That frosting…mmmm! Pinned! Carrot cake is definitely a cake worth making 😉 And cream cheese frosting is never optional! It’s been years since I’ve made a carrot cake. I think it’s time to make another one and this recipe sounds delish!! I’d love to try this carrot cake, but I don’t see oil in the recipe ingredients. There is 1 cup of oil. Mmmm… leave the raisins, and this is my perfect cake. I always love it when I challenge myself on a recipe and it actually turns out! I, NO LIE, made 12 batches of carrot cake last week, trying to perfect it. I should have waited one week and let you do the heavy lifting for me 😉 This is gorgeous! Pinned! is there any oil in it? I love making layer cakes! So great how you left the sides open. Very beautiful! 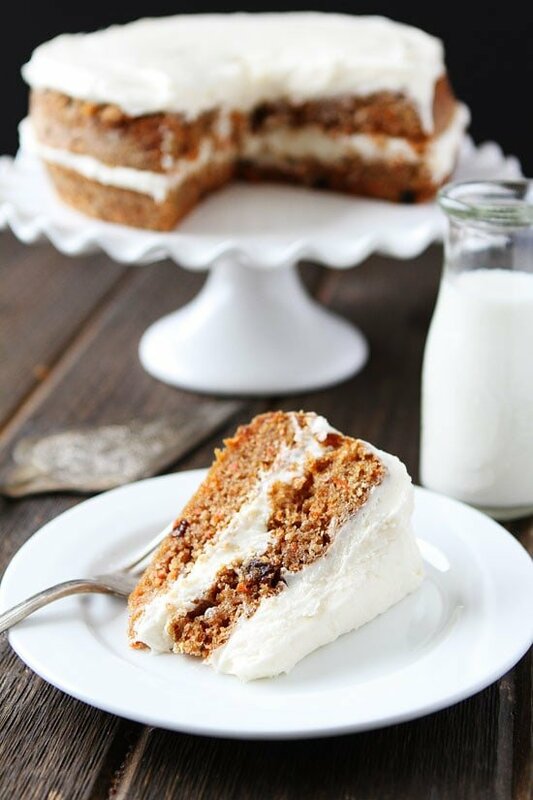 Such a gorgeous carrot cake…can’t wait to make this for my family. 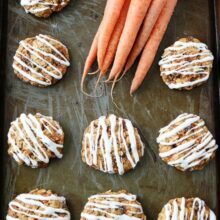 I can’t wait to make it for my carrot cake lovin’ husband! Love carrot cake! I haven’t had a chance to make it myself but I definitely need to! Carrot cake is the hubs favorite! Definitely need to make for Easter! I am glad to know that I am not the only one with a little layer cake anxiety out there. This looks amazing and manageable, so I might just have to give it another try. SO proud because this cake is gorgeous! Carrot cake is like gold in my family. We just can’t get enough of it. You’re so right in that carrot cake is not carrot cake without that tangy cream cheese frosting! I mean, you’d be cray not to top it with cream cheese frosting! I love raisins too. I’m sure I’d love this cake. Mmmmm….carrot cake is my favorite!! Dying to try this! Carrot cake is one of my all time favorites. You did a great job, maria! I LOVE carrot cake. This looks so good! It looks absolutely perfect!! Carrot cake is one of my favorites. If you do it in a 9×13 pan do you cook it for the same amount of time? 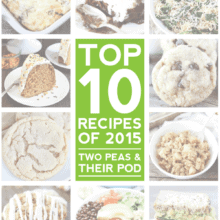 Can’t wait to try this….love carrot cake! I would check it at 30 minutes in a 9×13 pan. Enjoy! Would the baking time be different if making the 9×13 pan? Also, would the amount of frosting be altered? Looks delicious! Oh, carrot cake is my favorite. I can’t even have it in the house or I will eat the entire cake! This looks ahhhhMazing! gah!!! 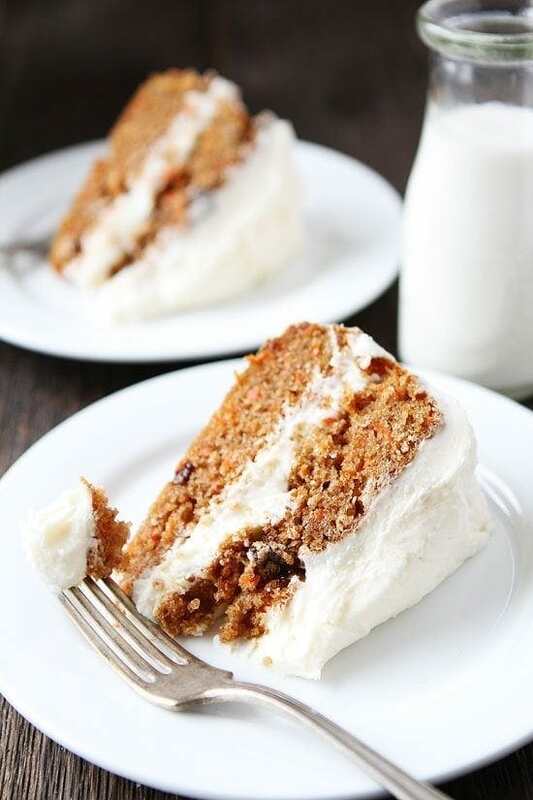 I love Carrot cake- this looks so good!! This cake looks amazing! I would be one of THOSE people to leave out the raisins 🙂 I don’t think we have ever had carrot cake on Easter (gasp… I know) so we will have to start a new tradition! My absolute favorite cake! It looks like you hit a home run. I’d need to pawn it off on my friends, too—all my “just another sliver” add up! I love carrot cake–it is my favorite. I am commenting because I LOVE the way you only frosted the top and layers. It looks great and is even a smidge bit less fattening. Great for any cake, but seems to suit the carrot cake well. Cream Cheese frosting is MUST for me too with every carrot cake! and a lots of it 🙂 It’s good your friends took away cake from you. Sharing solves twin purpose – happy friends and happy health! Whenever, I bake a cake, no matter how good it tastes, I just stop looking it or my dinner is only THE cake! 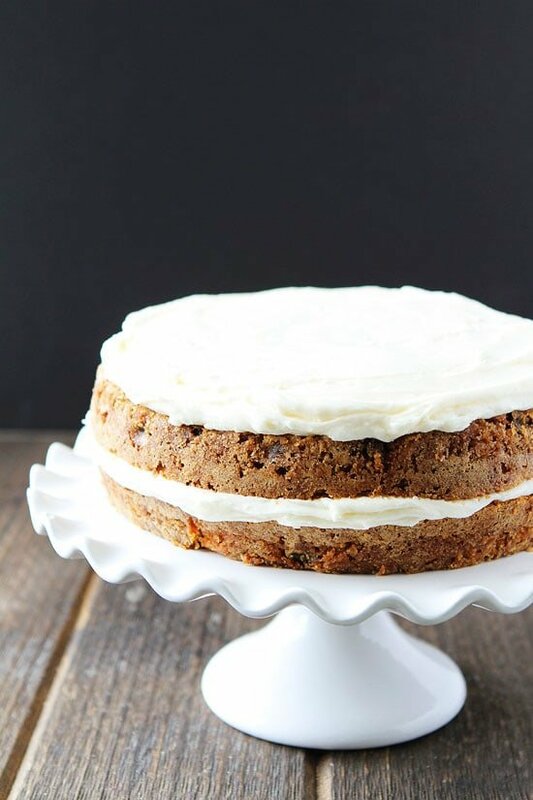 This carrot cake looks decadent and so moist, Maria! I will be definitely try it! pinning for later! Mmmm! This looks so moist and delicious! Love all that creamy frosting! Carrot cake is my favorite and cream cheese frosting is absolutely necessary! Your cake looks delicious. Good idea getting it out of the house! Looks and sounds amazing! Have you discovered the newest M&M’s flavor? Carrot cake! They’re ridiculous! Looks Yummy! Are there any alterations if made as cupcakes? This cake looks delicious! Thinking about making this for Easter! If I were to put nuts in the cake how much should I put in? Carrot cake is a favorite cake of the hubby and it’s more often than not the cake they we go to for birthdays. I personally like raisin but I will also use crushed pineapple in my cake (for all those raisin haters). Anyhow, congratulations on baking this lovely layer cake. It looks like you have a knack for it. Could you use a powdered sugar icing without the cream cheese? Love love love carrot cake – not raisins though! Can I omit the raisins without any “issues” in the final product? Opps – Just read the NOTE section. Raisins are out for me. Thanks. Cakes are so delicious. Thank you for sharing. I love carrot cake for the cream cheese frosting 😉 “Rustic” still looks super elegant in my book. I’m always paranoid that other people won’t like it, but when I see it in person I always think it looks professional. There is such a think as too much frosting, and I think that the way you decorated this cake sidesteps that issue. I can’t wait to cut a slice! This is gorgeous!! I love a proper carrot cake with cream cheese frosting – one of the best desserts ever! What a gorgeous carrot cake! Love!! Can I make this without a stand mixer? Will a handheld work? Yes, you can use a hand mixer. I think now that I’m grown up (I think), carrot cake may be one of my favorites! This one is perfection. Lovely cake! I have huge thing for carrot cake lately and I’ve posted one myself, since it’s almost Easter :). And I know the original one recalls for cream cheese, but I prefer a lot more with mascarpone, it’s ridiculously good! Could this be done in 3 8 inch pans? I just made this cake. I cooked it in 2-9 inch pans at 350 for 28 min. The cake came out really hard and dry around the edges. It did not have good flavor at all. It should of been taken out at 25min, if I had cooked it for the 30 to 40 min it called for it would have been black. Very disappointed as this was to go with Easter dinner. I made this cake for a family dinner and it came out amazing! I added this to my list of favorite cakes! Must try! Yay! So glad you liked the cake! Lovely looking cake! Looks so professionally made that I would never think it was homemade if it was in a bakery. Yes, you can add coconut. If you add a cup of coconut you should be fine without adding any extra liquid. No, it is 5 cups. You nee a lot of frosting for the cake. 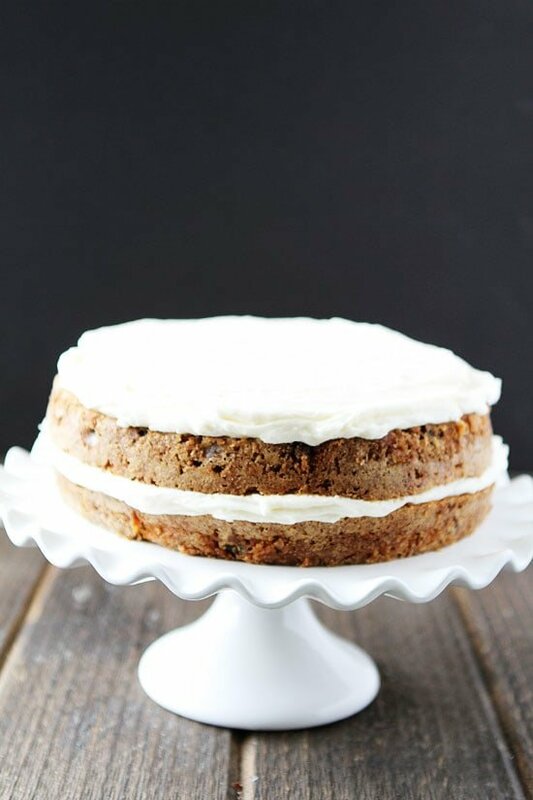 You will love this incredibly moist carrot cake with its ultra-creamy cream cheese frosting. Made with grated carrots and other mix-ins, this is my favorite carrot cake recipe of all time.soft, moist and delicious cake with cream cheese frosting and topped with walnuts.